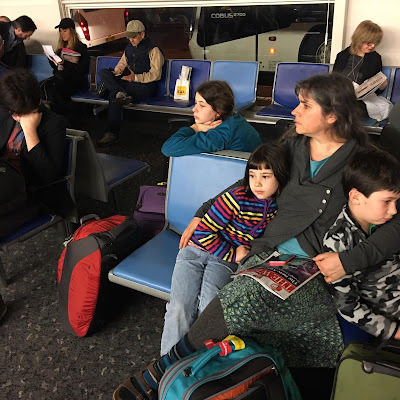 This trip has been simmering in our minds for a while now, but we bought tickets just two weeks before boarding the first of three planes that would bring us to Morocco. Winter in Oregon is a rather wet and grey affair, so when the opportunity arose to spend two months traveling in Morocco, Spain, and Portugal, we were more than ready to take it. Our love of travel combined with the right timing, low airfare, a strong US currency, and a desire to give our children exposure to many different cultures all aligned, and today I find myself sitting on the rooftop of a riad in the heart of the Marrakech medina. The sun has dipped beyond the rose colored mud brick walls, but a bit of its warmth remains. You would never guess that we're just a few minutes walk from the bustling, noisy Jeema el Fna square, as here in this courtyard there is stillness and birdsong. It is good to rest, and good to be here. The getting here, as you may guess, is its own story, a rather long and tiring one. The last few weeks have been a busy bustle of preparations, research, provisioning, and, for Erik, making sure our little fleet of five taxi cabs is in good working order and that everything was in place for our assistant to run the business while we're away. A last minute visit from my dear brother and his family who live in Alaska filled our last several days at home to the fullest as we gathered to celebrate and talk and catch up. Monday morning finally arrived, and my dad arrived at 7:30 to take us to the airport. And just like that, we were off on our grand adventure! Our first flight was delayed by about an hour due to heavy fog in Eugene. Thankfully we were in no hurry, and settled into waiting without being too bothered. I'm not sure why, but it feels so much easier for me to relax and let go of expectations when I travel. We arrived in Oakland, California by noon, and caught the shuttle to the hotel I'd booked for the night. The woman checking us in couldn't figure out how to input four children into the system, and the other clerk told her to put three down instead. Erik commented that sometimes it's tricky with four, and they assured him, "not with us" and encouraged him that having children is a good thing. Not surprisingly, this was a Muslim family. That, and the halal pizza (and House of Curries) adjoining the hotel made us feel that, although we hadn't yet left the country, good things were in store. The children thought that since it was a sunny 60 degrees and the pool was open that it would be the perfect time for a swim! After a chilly dip and a little time by the pool, we caught a bus to the BART station and took the train into San Francisco. The kids enjoyed the train ride, and once we reached the city we walked the several blocks to Chinatown. We had fun walking around exploring a bit and then ended our evening with some delicious Indian food, the best I've had in a long time. Pearl watching the world go by from the BART train. Crossing under the bay into San Francisco. I love that all the kids are peeking out. We walked by Blue Bottle Coffee, and I encouraged Erik to go in and get a cup from this iconic roaster. Granted, this was in the financial district of San Francisco, but it took a good 20 minutes or more for him to get his coffee. He said the feeling in the air was one of wheeling and dealing and high powered business. He wasn't impressed. Chinatown all decked out for the new year. Happy Year of the Rooster! We stopped in to watch fortune cookies being made. Quite interesting! Back at our hotel we got everyone settled down. I was awake most of the night, which seems to happen before a big trip. It's very frustrating knowing that I desperately need rest, but not seeming to be able to get it. At one point Pearl fell off her bed and came in with me and Erik, and then Poppy was having a hard time so I went in and slept with her instead. I finally dozed off and got a couple hours, for which I was very thankful! We didn't have to be at the airport until 3 the next afternoon, so we spent the day resting, sitting in the sun, and taking a small walk before catching the shuttle. We were grateful to be given a couple hours leeway on our checkout time. We had bought very inexpensive tickets from Oakland to London, England, and our flight left at 6 in the evening. A ten hour flight with children is not the funnest thing in the world, but it's greatly helped by personal entertainment consoles in the back of each seat. I do not sleep well on planes, but I think I got a couple hours somewhere over the Atlantic. We arrived in London, extremely tired, and were very happy to have a nice little bed and breakfast hotel waiting for us. A queen bed and two sets of bunks welcomed our weary bodies, and we all lay down and rested for an hour or so before making everyone get up. (Why do we have to leave the country to find rooms that are made for families?) 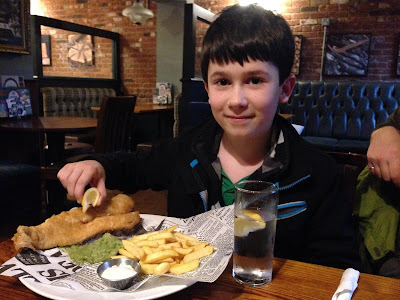 We walked into the little town of Horley and found a pub where we were called "my lovely" and "darling" by the woman who brought us steaming plates of fish and chips with mushy peas. Sitting in a pub eating fish and chips with mushy peas... must be England! The kids were up bright and early at 3:30 the next morning, well, with the exception of Pearl, who was awake at 1! Erik mercifully took the wakeful crowd to breakfast so Pearl and I could rest a bit more before returning to Gatwick Airport at 5:30. Waiting to board our flight to Marrakech... all a bit on the tired side by this point, but almost there! Our last and final flight was just three hours from London to Marrakech. I always love flying into a place, seeing it from above. The snowy Atlas mountains stretched out beyond the city, and, not surprisingly, a crew of workmen lounged in the field near the runway where we landed. We went through customs with no problem and were met at the airport by a taxi arranged through the place we're staying. Morocco so far has been amazing. We are recovering from days of travel and jet lag induced by an eight hour time difference, and easing ourselves into a culture that is full of wonder and mystery, madness and delight. HEY!!!! It's SO good to see this post! I can live vicariously through you and your family as you travel. What an interesting and lively tale! I can't wait to see more pictures, and hear more stories and fun!